Potted into a stylish contemporary forest green ceramic glazed pot with matching drip tray. This stunning premium ligustrum bonsai has exquisite, exposed roots, supporting a strong S-shaped trunk. The tree has bright foliage and symbolises peace and harmony. The Ligustrum is low maintenance but by no means compromising the beauty of the bonsai. The foliage is well distributed and the bonsai comes in a forest green pot with matching drip tray. 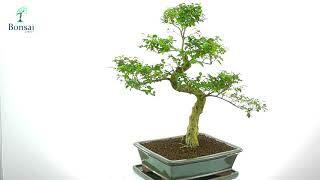 This bonsai would be a beautiful asset to any home.